2/1/19 NOTICE TO POTENTIAL GUESTS. We will be selling our condo in 2019. IF interested to buy the condo or save on the rental fees, find me on FB. Read this very carefully..... 4Bob 0Gorman 7in 3Florida 1with 2baby 3child 3as 3opening 3photo. We are offering a nice discount for people who will agree to allow Realtors to show our condo while they are there. Our rate chart reflects the discounted pricing. Several hours notice will be given at a minimum and the showing hours will be from 10 a.m. to 6 p.m. I will guarantee your stay in writing if you agree to this term. SPECIAL NOTE 1: For our Beach condo GUESTS .......FREE in condo wireless internet service. We recognize our guests need to have a computer/cell wireless signal inside our condo, so we have added this amenity and a Blu Ray DVD player too ! Also, there are beach chairs and umbrella Plus a 12 pack size hard sided cooler for your pool, beach or picnic use. SPECIAL NOTE 2: We remodeled our condo several years ago. We replaced all kitchen cabinets with clean white foil laminate cabinets, installed a deep double bowl black granite sink, nice tile backsplash and also installed a new stove and refrigerator, We also replaced our old entertainment cabinet with a new modern tapes and book storage cabinet and installed a new wall mount 37' Toshiba flatscreen TV. Further, we replaced our King bedroom furniture with a White Cottage set and also installed great looking'Mississippi Pine' wood laminate flooring in the bedroom. NO dirt catching carpeting remains in our condo. Additionally, our Heavy Duty Hurricane rated Turtle Tint windows and 9' slider door not only provides more safety, but more comfort for our condo guests as well. Our NEWER AC now cools faster and better. SPECIAL NOTE 3: IF you have a smoker in your party, PLEASE DO NOT REQUEST A RESERVATION. We have found that even if people promise to not smoke in our condo, their clothes and bodies carry tobacco smells into the condo, on the furniture, in the closet and on the bedding. Then when they are charged to have the condo defumigated, they pitch a cow. We do not want smokers staying in our condo, so please just move on to other condos to rent. Our guests' satisfaction is primary for us and they do not want their rentals smelling like ashtrays. Thank you. You expect to see GREAT VIEWS from a Penthouse level beachside condo and you will get them Big Time from our place. We have a number of e-referrals we can share attesting to the Fabulous Views you will experience 'On Top'. Beware: there are many condos in our complex which have very poor and low unappealing parking lot views. You're going on Vacation, right? You deserve to be able to say WOW !!!!!!!!! when you lease a beachside vacation condo. 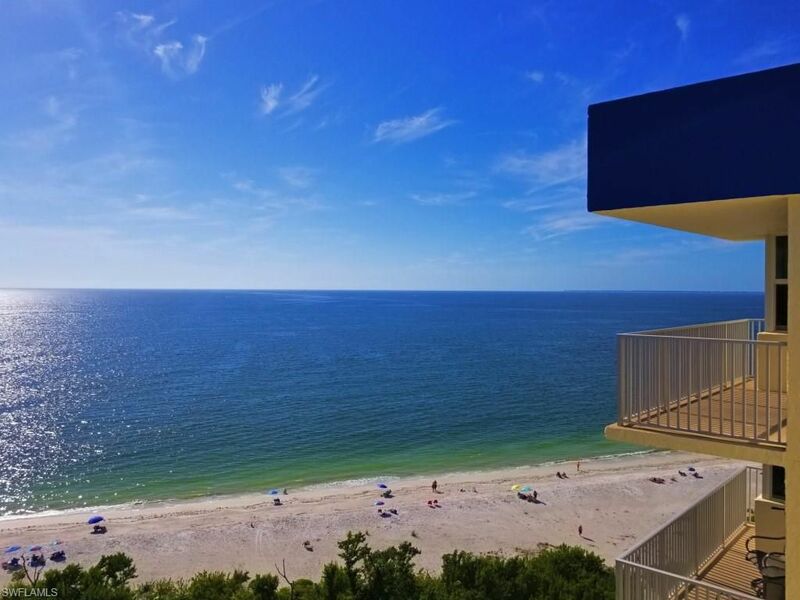 You will LOVE our Fort Myers Beach Penthouse condo views !! This Penthouse-level (14th floor) condo is situated on the Gulf of Mexico with fabulous views of Estero Bay, Naples, and Sanibel Island from the covered balcony. This one bedroom condo features a very comfortable king-size bed as well as a Lazy Boy queen sleeper sofa & a Scandinavian leather recliner with foot stool in the living room. Beautiful porcelain tile was installed in the 'Diamond' pattern on all floors except in the bedroom. The Kitchen is fully-equipped to include dishware and cutlery, fridge, range, microwave, toaster, coffee maker and blender. Towels/linens are provided (see amenities below). Just bring your own beach towels! There is a huge geothermally heated pool with spacious sun deck. There is also a large grassy area for additional crowd-free sunning or sports activities. 4-5 Restaurants, a CVS drug store and marina are just across the street. The beach trolley is only 25 cents and will take you from one end of the beach to the other and to Fort Myers for additional shopping or dining. There are two Supermarkets on the island. There is a Catholic Church & several Protestant Churches just up the street. Enjoy four, well manicured (free) clay tennis courts on property at this prestigious private Beach and Tennis Club. Cook out on the free gas grills near the floor shuffleboards. From your balcony, view dolphins playing and jumping in the surf. There are also many species of colorful birds to see such as pelicans, egrets, osprey, and herons. NOTE: Please notice the difference between the views of our Penthouse unit and lower floor units also advertised in VRBO. While lounging on the balcony, you will not look out directly onto the unsightly WEEDS of the Sandbar. Our guests comment on this all the time. This is an important point to make. Take early morning, afternoon, or sunset walks on the pure white sugar powder sand of this most beautiful beach. Stop in one of the many varied beachfront restaurants all along the boulevard. Enjoy dining or cocktails on their gulfside decks overlooking the beach. Beach sunsets are too beautiful to describe! Our rates are generally lower than most all others at this tropical paradise. Repeat guests are guaranteed the same rates for at least two years!! Also, any rental referrals you provide us will earn you rent credits for your own future rentals. Whether you desire a romantic get-away, a small family beach vacation, or are a retired couple looking for peace and serenity, you will find that you will fall in love with this little bit of heaven and want to return year after year. There is something for everyone. Hunt shells on the beach, play golf or tennis, swim in the Gulf of Mexico, or just 'veg out' at the huge heated pool. One of our favorite things to do is to enjoy breakfast, lunch, or dinner on the covered balcony just taking in the gorgeous beach sights and sunsets. You can also rent beach chairs, umbrellas, 2 person hood shade lounges w/cushions right on the beach behind the Wyndham Hotel. The Wyndham is just a short 4-5 minute walk up the beach behind the condo. Their Pinchers Grill is a great outdoor Tiki Bar which serves beer, mixed drinks and food. They often offer live entertainment. There are also a number of good restaurants and bars right across the street in Santini Plaza as well. * Weeks begin at 2 PM on Saturday & end at 10 AM on Saturday. kids but is not ideal for 4 adults. King bed is in the BR. Lazyboy Queen sleeper is in the LR. We have owned our Penthouse level condo for many years and many of our guests return year after year. We do our best to satisy our guests. Our caretaker/cleaner is Sue and she is happy to assist if there is any problem whatsoever. We aim to please. Understand that our out the door price quotes include rent, tax, exit cleaning and start up toiletry supplies. This is one of only 2 condos in Building 'A' where you can see OVER the other 2 buildings of our condo the way to Naples....AND see the Gulf of Mexico at the very same time from our balcony. The views are simply fabulous ! some DVD's but no guarantee as some get 'legs' and walk out of the condo.